We offer childcare for ages 6 weeks - 12 years of age. If you love children and the opportunity to touch the future, please send your resume. We are look for full time and part time caregivers and teachers. We offer for full time employees health, dental, vision, FSA, 50% reduction in childcare, 401k plan that matches 4% a 4 - 10 hour work week. Training provided to the right person. Stop by today for an application or send in your resume. We are looking for great people to join our team! We are in need of line cooks, dishwashers, servers, and bartenders. 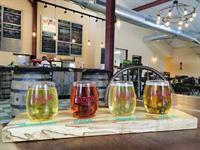 Skal is a newly renovated Scandinavian inspired tap house in down town Mount Horeb. We are a family friendly environment featuring 24 craft tap lines, a full bar and a modern take on the pub food menu. Please contact us at skalhalla@gmail.com or message us on FB. SKAL!